Ah, thank you for letting me know. It would be great if you would find out. Thank you for offering. (Wiki) In the 1960s, the two communities joined together, and in 2000, the resulting independent congregation moved to a new building at the Kingfield Hall site (Nether Edge). bostonwayne - I am coming through to you direct in due course. The full list of places from where I need photographs is back one page. Knowledge of my Yorkshire geography is limited. Here is all of the places where I need photographs. Just ask me for more details if any of these places are within your compass. Have you already got Evelyn Irene Murrell from Downham Market, Norfolk, accounted for? While looking for another Murrell casualties from the Great War I came across this report in the local press in 2015, when her name was added to the Downham Market War Memorial. "Evelyn Irene Murrell died on November 27, 1918 – a fortnight after Armistice Day – from the Spanish flu epidemic which is believed to have claimed more than five times as many lives as the war itself. Earlier that same year, she joined the Royal Air Force and was enlisted with the 51st Squadron at RAF Marham where she worked as a clerk. Although Miss Murrell was not killed in action on the front line, Spanish flu was considered a war injury and her personal situation meant she is entitled to be publicly honoured. As well as being the first, and therefore only, woman honoured on the town’s memorial, it has come to light that Miss Murrell could also be the sole woman commemorated on the List of the Fallen from the war. Her name will also be added to the memorial in the town’s St Edmund’s Church. Nobody knows exactly why she was not initially recognised, but it is believed many cases exist where the efforts of women serving with the armed forces have not been properly acknowledged." CWGC has her buried in Downham Market Cemetery. Whilst I have a photograph of her grave I was unaware of the new addition to the war memorial and the roll in the church. Thank you. I have added her to my requirements (actually my only requirement) outstanding for Norfolk. As I sent Jim my information via PM, others may be interested to know that there is no sign of Angelina Mary DACOMBE's grave at St. James's at Holt in Dorset. There are no parish records at the church or in the Dorset History Centre, and neither the Churchwarden nor I can find any sign of a plot or memorial. The separate village cemetery opened in 1947. Readers may know that sometimes, graves were marked with a wooden cross in those days on the assumption that by the time it disintegrated, no one would be interested in the person. Far from it! As the church has not retained a cemetery plan, and one has not been deposited at the Centre, it is unlikely that there is a surviving plan. In light of the information above about Evelyn Murrell, it seems that Angelina should be recognised by the community. The local press had this piece at the weekend - is she known to you? A memorial to those who died in the Great War marks the path to the graveyard and parish church perched on a hill outside my mid-Norfolk home parish of Beeston. The roll of honour includes munitions worker Gracia Bolton. She was born in 1898 at a farm near the church. Although her birth certificate gave her name as Grace, she was baptised Gracia Margaret. By 1918 she was working at No 6 Shell Filling Factory in Chilwell, near Nottingham, and lodging with her aunt at Regent Street in the town of Beeston nearby. From one Beeston to another … and the tragedy of July 1, 1918. Grace Bolton prepared for her late shift at 6pm. Just over an hour later a huge explosion destroyed the mixing house and ripped apart two of the three milling buildings. Eight tons of TNT had exploded without warning, killing 134 workers and injuring more than 250. Grace was one of 25 women to perish and her death certificate declares starkly: “Presumed killed as a result of an explosion. Deceased known to have been in work at the time and since missing”. Bravery shown by hundreds of survivors and other rescue workers prompted the Parliamentary Secretary to the Ministry of Munitions to describe Chilwell as “the VC factory”, a name that has stuck. Two workers were decorated for prompt action to prevent ignition of a further 15 tons of TNT. A government committee investigated several possible causes – a bolt had come loose and fallen into machinery, hot weather caused the powder to cake and even sabotage was considered – but all conclusions were dismissed in most quarters and just about every account gives the cause as “unknown”. The Beeston, Norfolk, and Beeston, Notts, memorials record her as Gracia Bolton. The Chilwell memorials settles for Grace Bolton, the name on her birth and death certificates. She died just under a month short of her 20th birthday. (The Beeston concerned is near Litcham in Norfolk - we have several Beeston's in the County). Thank you, Peter. She is one of mine. Where Gracia has come from I do not know. I have her as Grace Margaret Bolton as this is the name on her birth and death certificates. I had been in touch with one of her descendants who, as well as giving me information about her, provided a rather nice family photograph. Chaz - PM received and replied to. Jim, are these the names you want from Brantford, Ontario? St. Thomas' Church, Walton-on-the-Hill, Staffordshire. Jim who do you need in Lichfield and Uttoxeter? LICHFIELD - Emily Mary GLADMAN, VAD, died 10th July 1919, is buried in St. Michael churchyard, Lichfield. UTTOXETER - Christine STEWART, VAD, died 26th October 1918. She is buried in grave 406av, Uttoxeter Cemetery. Also her name off the Uttoxeter War Memorial. After calling the hugely helpful Wiltshire and Swindon History Centre (http://www.wshc.eu/), I located Violet Flint's grave at Barford St. Martin, Wiltshire today. She lies in a rather small, neglected cemetery to the north of the village on the narrow Groveley Road, just short of the railway bridge. That said, there are several war graves therein, including some Australians, which rather chimes with the nationality of her husband. The inscription is partially legible and reads: 'Peace Perfect Peace' on the cross, and below: 'In loving memory of VMF the dear and beloved wife of Percy Edwin Flint AIF who (illegible) rest on 12th October 1918 aged 25 years'. It was a grey afternoon and her gravestone faces east under the trees, so I'm afraid that the photos are of limited quality. Please say if you want better and I can return in morning sunshine. Here is an example. If you PM me with an email address, I'll send a selection. I presume that you have the information recorded here: https://livesofthefirstworldwar.org/lifestory/4969690. Jim - P.S. 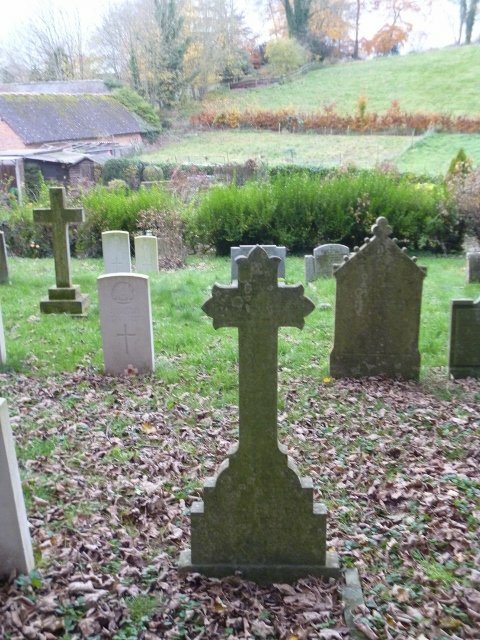 Can you relate how Violet died and what she was doing in Wiltshire? Only partially. Violet died of pneumonia (Spanish 'flu). Why she was in Wiltshire I do not know but the probability is that her husband had obtained work there. You have listed Blairdaff, Grampian as outstanding. Did I miss something when I was there earlier? As usual, I have a terrible memory and can't remember who I actually covered there but reasonably sure I got them. Sorry, Kenny. Photographs were received but omitted to amend the list. Now corrected. I have resent 'Tranche 1' of Violet Flint's grave photos again and hope you now have all four emails. Please let me know. As I mentioned earlier, I'm happy to back and retake on a sunny day, if required. Tranche 1 safely received with thanks.